When we took a look at the update to Deep Space Nine we did for Victory is Life, we decided we wanted to go a step further. While DS9 now looked amazing on the inside, it was time to make the exterior match the interior. Luckily, we knew just the man for the job. We’ve partnered with Tobias Richter, modeler extraordinaire, and the man made the 3D model of the Enterprise D when Star Trek: The Next Generation was remastered into HD. We sat down with Tobias to talk about his work. Star Trek Online: Hey Tobias! Thanks so much for joining us. Can you start by telling us a little bit about yourself and your relationship with Star Trek? Tobias: My name is Tobias Richter and I am a life-long SciFi - and especially Star Trek addict. When I was a child the original Star Trek ran on TV and I tried to see every episode of it. I was drawing Trek starships, making blueprints, wrote stories. Once I got my first computer - an Amiga - I started writing my own Star Trek game, which I, about 2 years later, released into the public domain (Star Trek - the game). You played the captain of the Enterprise and had to manage the ship, crew, different missions, fights with Klingons, and so on. It became rather popular among Amiga-fans. After I finished my study I moved to Cologne and worked as a freelancer for various TV and game productions. During that time, I was tasked with creating the German cover for the video release of Star Trek (TOS and TNG). I think that was probably the first time working on an official Star Trek project. Later on, I supported Paramount Germany in their merchandise products. In private, I was building most of the ships of the Star Trek universe as detailed as my abilities and my computers abilities would let me at the time. I created illustrations just for the love of it and put it on the internet. Including the new Enterprise from the first JJ movie - before the film came out. I had a nice email chat with JJ about the ship. Doug Drexler saw the illustrations and asked me to do some renderings for the "Ships of the line" calendar - so that year I created a Kelvin and an Enterprise image for them - and in the following years a lot of other illustrations. In the last years I was lucky enough to work for various Star Trek projects - computer games, book illustrations and animation clips. STO: How did you first get into the 3D Modeling world? T: I always loved building things - be it model kits when I was young - and once I had my first computer I looked out for programs that would allow me to build stuff on the computer (since my own programming skills aren´t that good). Around came Videoscape - one of the first programs to let you do 3D modelling (in a texteditor, with a 1000 point maximum) - and the successor of the famous Lightwave. Sadly, Videoscape couldn´t do textures or shadows - so I switched over to a German program called "Reflections", which was rendering raytraced pictures - it sometimes took hours for a 320x200 wide picture, but it was a fantastic new world. Once I got to Cologne I invested in professional soft&hardware - Silicon Graphics and Alias/Wavefront. That later became Maya, a software I still use today, just not on Silicon Graphics anymore - today we work on PCs. STO: Tell us a bit about the DS9 Model. What was your process to recreate the space station? Did you have to do a lot of research from the show? How long did it take? But with that in mind, I of course wanted to be as exact as possible with all three models. I had all the literature available and even consulted with the original designers about some issues that I couldn´t quite make out (e.g. the angle in which the horizontal pylons go from the outer ring to the inner ring). For the DS9, it took probably around 2 weeks to model it, and another 2 weeks to texture and light it. STO: What’s your favorite part of the station model? T: From a modelers standpoint I like repeated elements. And DS9 is perfect in that regard - you basically need to build 1/6th of the station and then can mirror/copy the whole station. And the best part is that it doesn´t look that way - you do not notice those repetitions at first glance. It´s a great design and lay ground to the Cardassian architecture. The top center and the base of the pylons are my favourite parts. The center because it has the large windows where you can see inside the station, and the pylon base because it resembles the Cardassian physiognomy and has that special "alien" design touch. STO: What are some details of the model that players might not notice on first glance? T: In our high-res model, we built a low-res promenade behind the large windows in the center region. We thought about putting that into the game-model as well, but the station is already at a rather high polycount - and you would need to get really close to be able to see anything, so unfortunately we decided against it. For the rest I think we managed to capture the look of the high-res model very well. All the details are there, either through polygons or through the normal maps. STO: What do you think it is about Deep Space Nine that makes it so popular today? T: First of all it is Star Trek - and Star Trek is popular in all its incarnations - there are several TV channels in Germany that play Star Trek episodes over and over again. Plus DS9 is a special kind of Star Trek - all the other series take place on a starship moving through the galaxy - and here we have a station with a whole set of other problems. It led to interesting other stories that not necessarily could be told with the other series, especially longer arcs. And of course the great cast and great chemistry among them - which is something that luckily all the Trek crews seem to have. STO: Thanks so much for joining us, Tobias, and thanks for your work on the model. It looks great! T: It is always fantastic to see your work in an official Star Trek production. 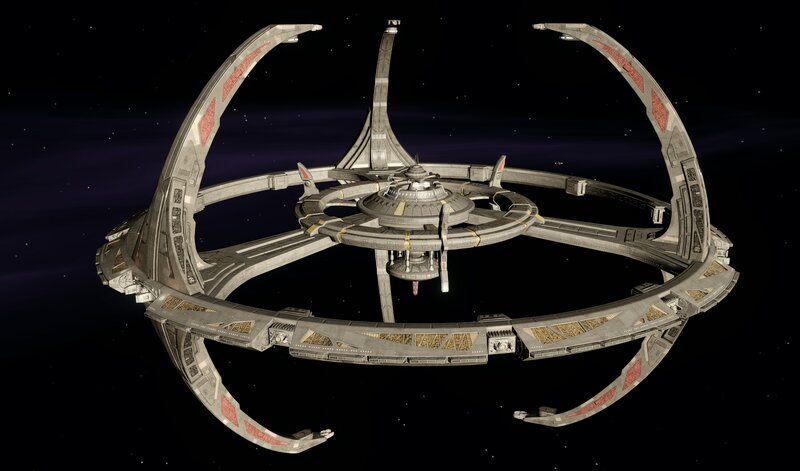 I look forward to seeing and visiting the station in STO! 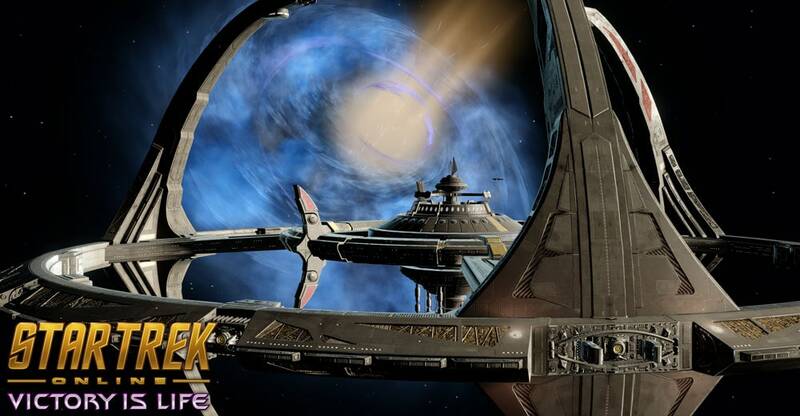 You’ll be able to see the officially remodeled DS9 on Tribble very soon, and it will be a officially a part of Star Trek Online with the launch of Victory is Life!